fabulous motherhood: Our Today Moments.. It's already 2nd week in 2014 and hopefully its not too late for me to wish everyone a blissful New Year 2014. I believe everyone has already set their resolutions for this year. All the best mommies! Same goes to myself, I've created list of new year resolutions every year and over the past 2 - 3 years, all my resolutions were more towards my family specially my kids. Honestly, one of my main resolutions this year also to be more focused on my kiddos early learning (extended learning at home after school session) and I wish I could spend more quality time with my family by having great activities together soon. 2013 itself marked an awesome year for me. It went by without me actually planning on that, and I was so thankful to Him and so blessed with what I have now. It was a waste of time thinking on the past few years where I only thought that my elder son only need to start his early childhood learning when he go to preschool at 5 years old! My biggest mistake in my life! And I promised to myself it won't be happened to my next kiddos. Alhamdulillah, my biggest target last year to help Adam on reading, writing and reciting Surah achieved. *proud mom* He can now performed Shalat with proper recitations. He can also read a few English books and his writing improved alots. What I did last year, was a very big changes to my life and my daily routine specially on weekdays. We had at least 20-30 minutes daily activities that we called as "family quality time" at night after bath and dinner, where my hubs and myself will focus on our kiddos learning including reading, writing and playing with their toys before they went to sleep. 20 minutes a day for reading.. Helping my kiddo on spelling..
After all, with the ever-rising cost of living in the city , it does not allow most mums to quit their jobs and be a full time stay-at-home moms!Yet, this is not the reason we can overlook on our children needs. Its all about how we able to manage our time and prioritize quality time with them. Its hard to measure the quality time we spend with our kids daily especially when we only consider it something must be only related to learning perhaps. Think of it in the another way. It will turn to sweet moments when we try to utilize short period of time we have daily as a quality time. As I do not have a helper at home *yes my husband helps me alot in doing the daily house chores and taking care of our children - he contributed to the % as well hehehe* I love to create bonding moments with my kids by encouraging them to help us on our daily and weekend household chores such as hanging up and folding the clothes, clearing up their toys and sometimes doing cleaning. Yeap, these also teach them on practical life as well. Being a working mom or stay at home mom, our biggest challenge are still the same in providing the best for our kids. Let us create the moments we have today and turn into beautiful moments for our kids to remember when they grown up. 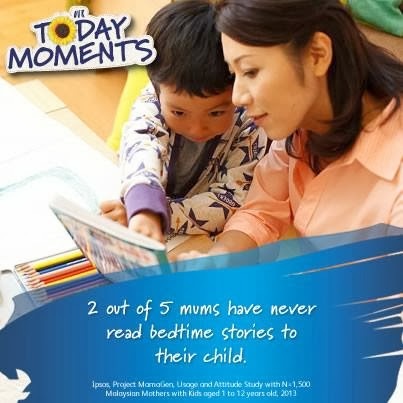 Do visit Friso facebook Fan Page *click here* to know more about “Our Today Moments” campaign and survey results as said earlier. They also share good tips on having a quality time with our children too. All the best mommies! Assalamualaikum, thanks gor sharinng this as i still figure out the best for my toddlers too, will visit our today moments now. i'm a working mom.. i wish i am a sahm..thanks for this post. somehow it lift up my spirit to do better for my baby..keep writing ya..
Hai.. read here.. same with you.. im joint the survey too.. salam kenal ye..
need to spend more quality time with kiddos.